During battery charging, oxygen and hydrogen are released after a cell has achieved approximately 95 % of its charge, during boost charging or overcharging and the resultant risk is required to be assessed under Part 3.1 of the NSW Workplace Health and Safety Regulation 2011. The NSW Work Health and Safety Regulation 2011 (WHS Reg) prescribe specific duties in relation to exposure standards for specific chemicals and mixtures and hazardous atmospheres at the workplace. The exposure standard refers to the publication by Work Safe Australia “Workplace Exposure Standard for Airborne Contaminants” with the Date of Effect being 22 December 2011 which does not list hydrogen as an hazardous to human health. combustible dust is present in a quantity and form that would result in a hazardous area. Unless in a confined space with little natural or mechanical ventilation, the risk of hydrogen replacing oxygen is low. It should be remembered however that hydrogen is lighter than air, and will therefore be an increased risk at higher elevations. The explosive limits for hydrogen is between 4 % and 75 % by volume in air. 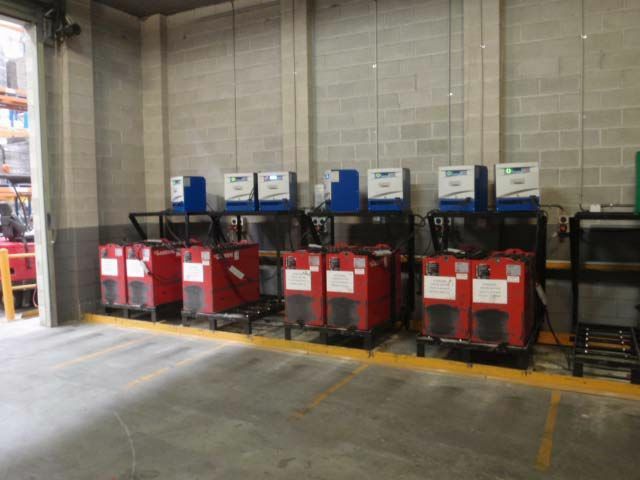 where AS 3011.1-1992 Electrical installation – secondary batteries installed in buildings Part 1 Vented cells sets out requirements for permanently installed batteries installed in or on buildings. 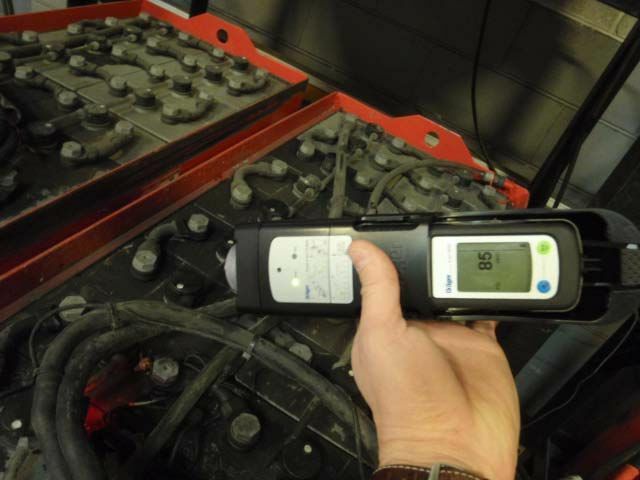 The standard may not be directly applicable to forklift batteries which are not permanently installed fixture to the building. Hydrogen gas can be measured through a range of direct reading instruments to monitor the airborne concentration. Safe Environments use a Drager X-am 5000 with H2 sensor which can also pump air through tygon tubing at heights with extendable carbon fibre poles. Hard installations can also be used and is recommended to provide continuous feedback as to the airborne hydrogen gas concentration. The equation while set to maintain the room at 2% is still above 5% of the lower explosive limit, being 0.2 %. This concentration is unlikely to be achieved unless there is thermal runaway whereby batteries are constantly overcharged. In the majority of instances, such as charging forklist batteries, there will be a short period of hydrogen gas evolution. It is best to stager charging times to reduce the maximum airborne concentration. The principle risk from battery charging rooms the potential for the mechanical ventilation failing, which may lead to an increased build up of hydrogen. It is recommended that alarms be installed to warn of the failure of the exhaust fan and hydrogen monitoring to warn when high levels are encountered. Other potential hazards in battery charging rooms include potential for airborne sulphuric acid or potassium hydroxide. It is recommended that gloves and suitable eye protection be worn when handling batteries. The risk is likely to be highest during summer months due to higher evaporation rates. Do not handle metal objects and clear pockets of metal objects that could call across terminals. Keep sources of ignition well away from charging batteries. Ignition sources within close proximity (i.e. 1 -2 meters) may still cause an explosion due to localised concentrations of hydrogen gas escaping the battery housing. Ensure employees are aware of the risks of hydrogen gas through training, Safe Work Method Statements (SWMS) and promote the use of PPE during charging of the batteries.